Companies involved by the WEEE directive have adapted their organizations to provide relevant data to compliance schemes and to authorities. However, the existing system has almost 15 years now. Its time to update the classification system and this is what the EU has decided. Since the revised WEEE Directive (2012/19/EU) came into force, we know that from 15 August 2018 the scope previously described by the 10 WEEE categories will be extended to a so-called open scope (Article 2, Para. 1b Directive 2012/19/EU). What does that mean? Temperature exchange equipment: fridges, freezers, air conditioning, etc. Screens, monitors, and equipment containing screens having a surface greater than 100cm²: TVs, computer monitors, etc. Large equipment (any external dimension more than 50cm): washing machines, dish washers, cooking stoge and hoven, cookers, luminaires, large printers, copying equipment, large equipment in general, etc. Small equipment (no external dimension more than 50cm): vacuum cleaners, calculators, video cameras, cameras, hifi equipment, watches and clocks, smoke detectors, payment systems, etc. Small IT and telecommunication equipment (no external dimension more than 50cm): mobile phones, tablets, routers, laptops, GPS, printers, etc. Most national compliance schemes for WEEE so far aligned their pricing system, declaration categories and more to the previous 10 WEEE categories. According to the new requirements, all across Europe they are currently working on a new structure that finally allows them to report back to their national Ministry the total EEE put on the market by producers as well as WEEE collected, treated etc. according to the 6 new categories. 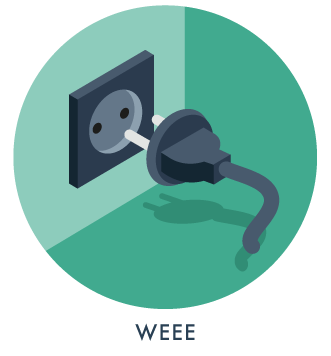 Therefore over the coming months we expect most national WEEE schemes to provide new price lists as well as new declaration categories and subcategories for producers. A harmonization among compliance and take back schemes is not expected. Finally there is another aspect about the open scope: the legislation clearly states that, apart from some exemptions (Article 2, Para. 3 Directive 2012/19/EU), the WEEE Directive shall apply to ALL EEE (no more to EEE covered by the previous 10 categories). Although it is hard to find examples of such equipment new to the scope, with this new definition the legislator makes it more difficult to leave out EEE and anticipate a potential inclusion of spare parts in the WEEE scope.